What happens when an idealist volunteers to introduce Shakespeare to a group of unruly kids? Bedlam. Tears. And hard lessons learned. Convinced that children can relate to Shakespeare's themes--power, revenge, love--Mel Ryane launches The Shakespeare Club at a public school. Teaching Will is a riotous cautionary tale of high hopes and goodwill crashing into the realities of classroom chaos. Every week Mel encounters unexpected comedy and drama as she and the children struggle toward staging a production of A Midsummer Night's Dream. Woven through this fish-out-of-water tale is Mel's own story of her childhood aspirations, her acting identity, and the heartbreaking end of her onstage career. In the schoolyard, Mel finds herself embroiled in jealousy and betrayal worthy of Shakespeare's plots. Fits of laughter alternate with wiping noses as she and the kids discover a surprising truth: they need each other if they want to face an audience and triumph. 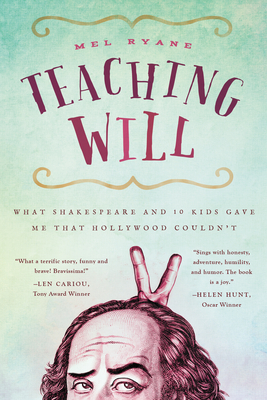 Teaching Will is an uplifting story of empowerment for dreamers and realists alike.